ser·en·dip·i·ty noun \ ser-ən-ˈdi-pə-tē \ : luck that takes the form of finding valuable or pleasant things that are not looked for. SERENDIPITY is also the name of a terrific antique store in the Old Town section of Temecula. They’ve got a very good garden section out back; I found these succulent containers in their green house. 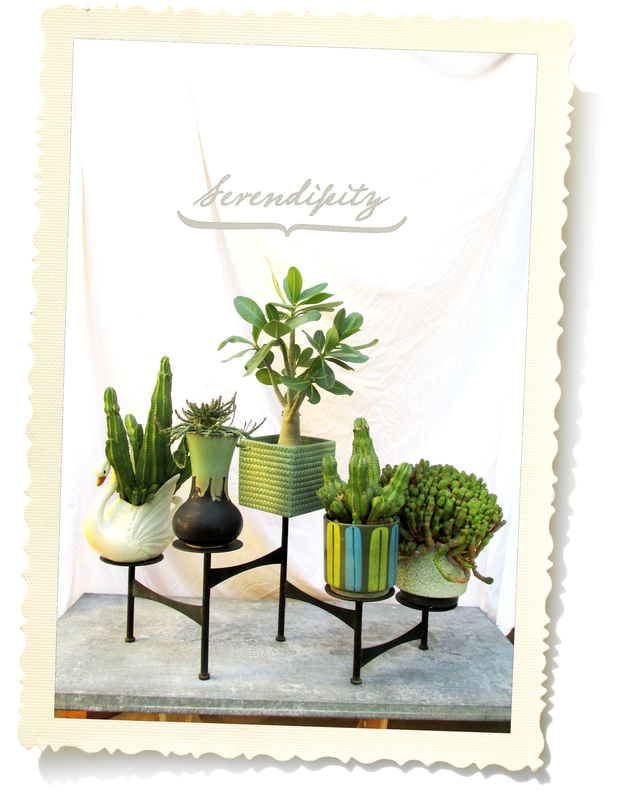 Created by Jeanne Garcia, for Rancho Garcia Garden Art, each vintage container boasts a complementary succulent. I was drawn to the diverse good looks of the vessels, with their mix of glazes and textures, and I loved their healthy and equally diverse plants. Unable to decide which I liked most, I took them all — including the amazing exploding swan that got to the cash register late and had to be added on. Lucky I did, too, or there would be an empty slot on my ’60s-era plant stand and the photo wouldn’t be nearly as charming. Discovering these together was a bit of good fortune, but they weren’t my only find that day . . . 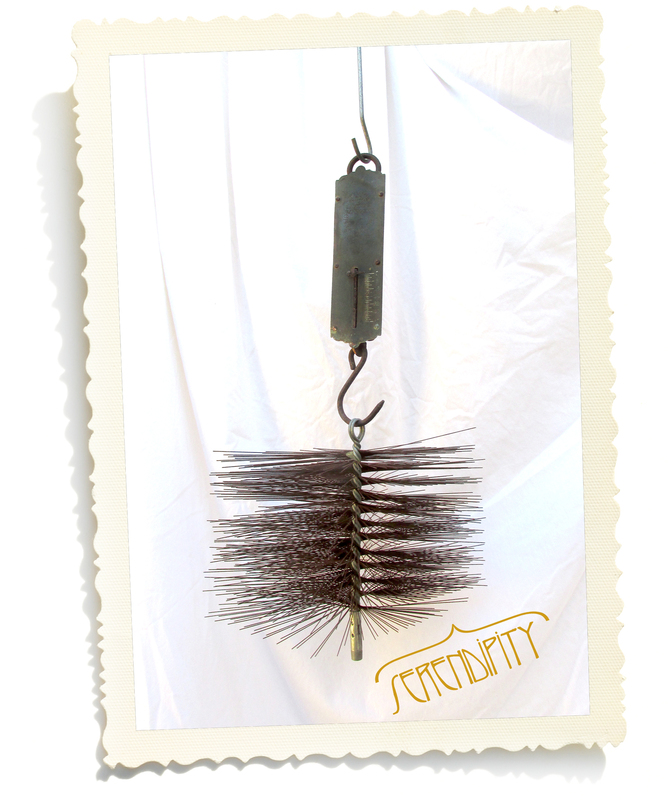 Heading inside to the cashier, I looked up and spied this amazing antique wire brush suspended from the rafters. All it took was a question for a ladder and willing shop assistant to appear, and I had it and the scale it was attached to in my hands. By rotating the brush I had the bristles producing a visual effect that reminded me of ’60s-era op art. I added it and the scale to my happy haul. It was only by chance we ended up in Temecula that day: We’d pulled off the freeway on our way back from Encinitas so that I could walk off a dastardly back spasm. While there we lucked upon a fruit stand owned by two cousins of mine; we had a nice chat … it was after that I made these finds. For a short stop, our visit to Old Town was full of surprise finds I valued personally. In a word, it was serendipitous. Very nice… I’m going to have to stop there sometime and check it out. I love that the plant store’s name starts with Rancho… now that’s serendipity! I thought the same thing a week later, WF, once I’d finally looked at the business card they’d given me. WOW!!! What a great find. The plant stand is perfect and I especially love the swan. I have a pain of old western boots of my husband fron out time in Texas that I want to plant once I find the right plants. It would be great if I could find an old steer skull to go with the boots. That would be my serendipity! Thanks, JR, I thought it looked pretty great, too!